Pacquiao vs. Bradley 2: Fight Time, PPV Info, Odds and Undercard Schedule - Balita Boss! The Philippines' pride Manny Pacquiao and welterweight titlist Timothy Bradly Jr. will meet again this Sunday, April 13, 2014 (April 12 in US) at the MGM Grand in Las Vegas. 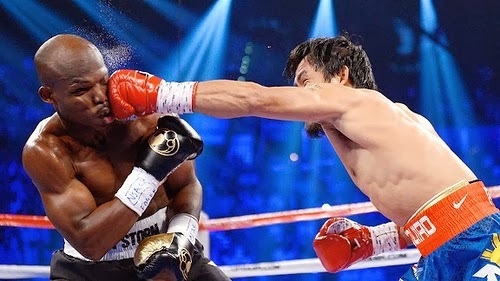 The second fight of Pacquiao and Bradley is one of the most anticipated rematches in recent memory, where in their first meeting back in June 2012 the fight will go down as one of the most controversial decision in boxing history. Undefeated Bradley took Pacquiao’s WBO welterweight title via highly disputed split decision. The official judges scored the fight as 115-113 (Duane Ford and C.J. Ross for Bradley), and 113-115 (Jerry Roth for Pacquiao). Pacquiao and Bradley are out to prove who really won the first fight. Pacquiao will have to regain the WBO welterweight crown and avenge his loss. Bradley will make the third defense of his title and will also try to get a well-earned decision.